During the 12th Annual Oscar Wilde Awards at Bad Robot headquarters in LA (celebrating Irish talent in entertainment), NY Daily News reports that Star Wars: The Force Awakens director J.J. Abrams set the stage for Star Wars: The Last Jedi Oscar hopes. Specifically, for Luke Skywalker actor Mark Hamill. Hamill himself recently joked about doing an Oscar-caliber monologue on Force Awakens, in which he only carried one crucial-but-silent moment of screen time. The idea of a scruffy mentor Luke nabbing an Oscar nod may seem far fetched, but there’s actually plenty of precedent for it. Sir Alec Guinness got a Best Supporting Actor nomination in 1978 playing Luke’s mentor Obi-Wan Kenobi in A New Hope, and believe it or not, there was genuine Oscar buzz for Frank Oz’s puppeteering performance as Yoda in The Empire Strikes Back! Although there has been no official word as to how big Hamill’s role will be in Last Jedi, it is widely accepted that he will have a strong supporting part alongside Jedi-in-training Daisy Ridley, if not the lead role. Many fans hope that before the credits roll, Luke will also get to reunite with his twin sister, the late Carrie Fisher’s Princess Leia, in what would surely be an emotional moment for everyone. All will be revealed in 9 and 1/2 months time. 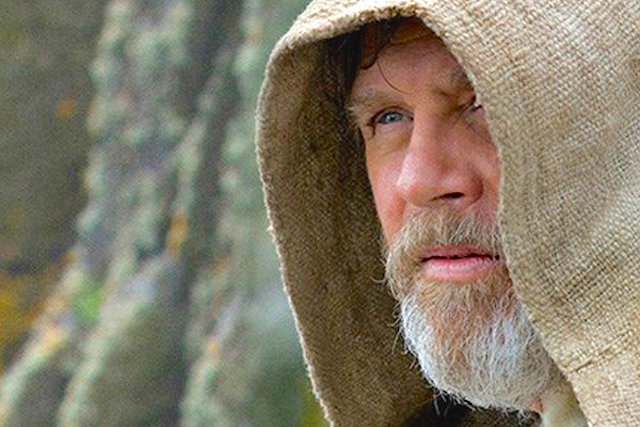 Star Wars: The Last Jedi is written and directed by Johnson (Brick, Looper) and continues the storylines introduced in Star Wars: The Force Awakens, welcoming back cast members Mark Hamill, the late Carrie Fisher, Adam Driver, Daisy Ridley, John Boyega, Lupita Nyong’o, Oscar Isaac, Domhnall Gleeson, Anthony Daniels, Gwendoline Christie, and Andy Serkis. New cast members will include Academy Award winner Benicio Del Toro, Academy Award nominee Laura Dern, and newcomer Kelly Marie Tran. The sequel is produced by Kathleen Kennedy and Ram Bergman and executive produced by J.J. Abrams, Jason McGatlin, and Tom Karnowski. The Star Wars: The Last Jedi Oscar campaign begins when the movie opens on December 15, 2017.